Connolly’s remarks came at a briefing Tuesday of the DC-area House and Senate members by Federal Transit Administration (FTA) officials on its Safety Management Inspection of Metro. The briefing was in response to the January incident at L’Enfant station, where one woman died and 84 passengers were hospitalized after their train car and the Metro tunnel filled with smoke. The FTA will release a report on the incident on Wednesday. Sens. Warner (D-Va.) and Kaine (D-Va.) said at the hearing Metro needs a turnaround specialist as its next general manager. Metro GM Richard Sarles left the agency in 2014. “Unless Congress is willing to pass a long-term transportation bill, aging infrastructure and inadequate funding will keep causing transit challenges,” Kaine said in a Tweet. 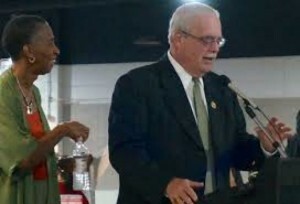 Photo: Rep. Gerry Connolly (left) at Metro Silver Line opening in 2014.